Set-up charge is $40 net. Set-up includes standard stock design backer card and front and back sides of the loop. There are die charges for custom shapes other than our standard 2 inch circle. Call for a quote Michael Senoff 858-692-9461. Order minimum is 250 pieces units per design. All loops include unlimited full color digital process printing. Pantone matching is free. No charge for color changes throughout your order. Example: 50 with blue background, 50 with white background, and 100 with a red background. All carded loop items are individually booger glued to a 4X6 inch backer card. Backer cards can be poly-bagged for an additional $0.30 per unit. Rounded corners add .03 per unit. Q: What are my client's branding options ? On the 2 inch round back part of the disk, each loop can have black and white printing. This printing will be seen when the user applies and takes off the loop from the device. 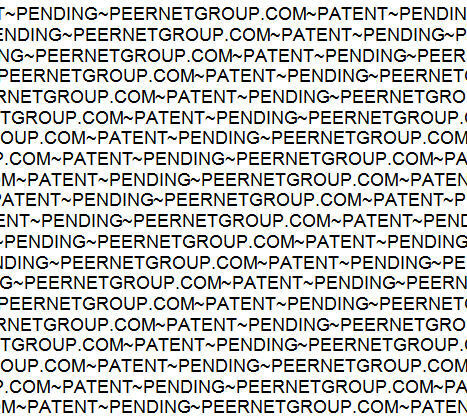 All loops are required to have the words PATENT~PENDING on the back. You may brand your website, company name, email, or brand name on the back of each loop. For color used on the back side of the loop, add an additional $0.20 per loop. Your brand logo in b&w here. You may include website URL, address, and contact information. For 4-color card backs, add $0.25 net per unit. We want the end user to be happy with the product, and it's important for them to understand how to use the product. 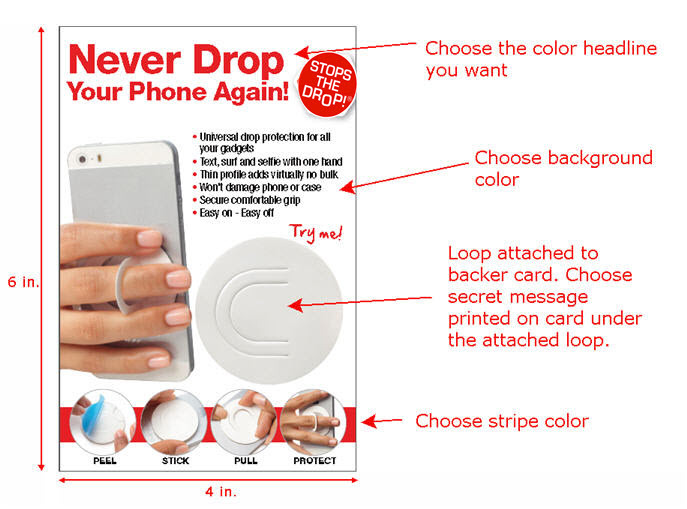 The back of the card offers the end user both detailed instructions on how to use and apply the loop properly to their device. Additionally, your client has space for private label branding, barcode QR code, website URL address, city and state. A large assortment of optional packaging is available, including boxes, bags, and retail counter-top displays for an additional charge. Country of origin is USA and will be marked on all backer cards for all products. 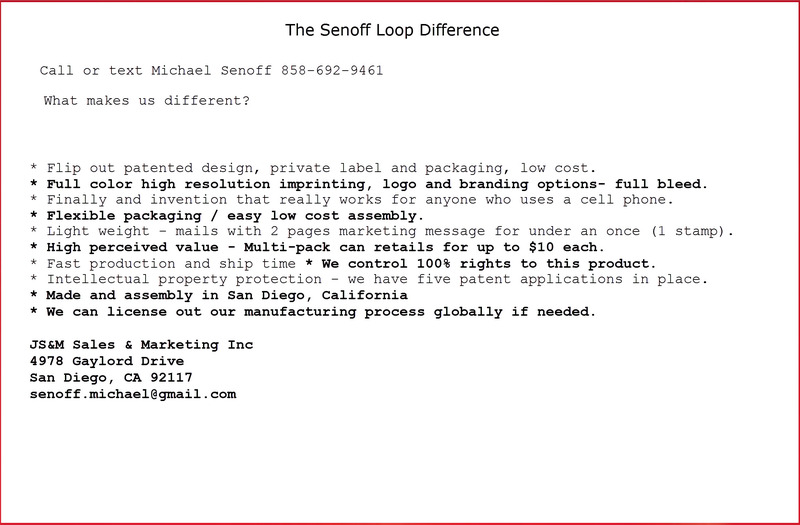 Loop may be ordered in bulk without backer cards. Back Of Card Branding Options. You'll get a full 24 square inches of 4 color branding on the backer card. The backer card is 4X6 in. We can do custom size backer cards for retail, too. You are also are free to print your own cards and order the loops in bulk. All bulk loop orders are sent unassembled. The printed plastic 2 inch disk will be sent separately from the 2 inch adhesive stick pads. Pads and Loops will be sent in units of 500 per package. Instructions will be sent for information on fastest assembly methods. For stick pad assembly, add an additional $0.12 net per unit. All orders are confirmed in writing with your PO #. Please refer to your PO when inquiring. When reordering, please refer to prior purchase order number if available. Orders submitted via telephone are not valid and must be followed by a written purchase order. All purchase orders may be emailed to senoff.michael@gmail.com or faxed to 858-274-2579. For drop shipping or split shipments, add $5 per location plus freight / handling. A list of addresses is required with purchase order. Add $6.50 per box for 3rd party shipping. All quoted prices are subject to change after quotation, based on artwork requirements. Prices are valid for 30 days after quotation date. Only quotes done in writing will be honored. Additional random samples are available upon request. A UPS or FedEx account number is required for rush samples that cannot be sent via standard USPS. Any cancellation of an order in progress will be subject to all costs incurred to that date. Any change must be in writing. If artwork has been created by our Art Department before cancellation, a $40.00 (P) charge will be incurred. Customer is responsible for all surcharges from carrier if a wrong address is specified on your purchase order. Goods should be inspected upon receipt. Any claims or discrepancies must be made within 7 days of receipt of merchandise. The PayPal address is senoff.michael@gmail.com Surcharges may be applied on certain orders due to high processing rates. All items are manufactured in the USA and will have the country of origin marking in accordance with US Customs regulations. Certain circumstances require a country of origin sticker or stamp on the product. All items made by JS&M Sales and Marketing are manufactured in the USA.